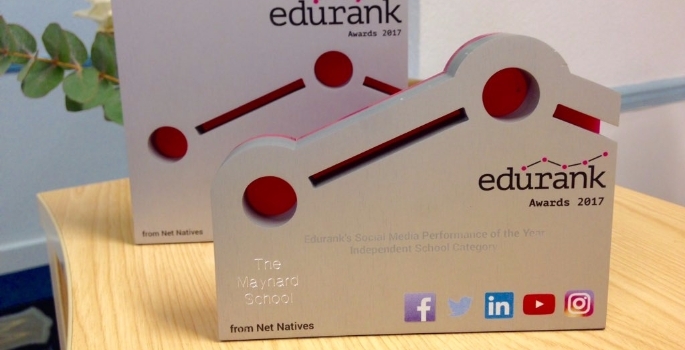 The Maynard School is celebrating another enormous marketing victory by winning the prestigious Edurank ‘Social Media Performance of the Year 2017’, beating competition from all other independent schools from across the UK and Ireland. The all-girls’ school based in Exeter also scooped the ‘Best YouTube Performance’ in the Independent School category for its award-winning film #MadeForGirls. “These awards recognise and celebrate the success of social media marketing within the education sector, and are based on our performance across Facebook, Instagram, Twitter and YouTube,” said Joanna Conway, the Marketing Manager at The Maynard. “We are conscious that we live in a digital age and our marketing has evolved over the past few years to embrace this. We work hard to promote the school as well as the many achievements of all our students using the likes of Facebook and Twitter, as they are effective platforms through which to reach a maximum audience. It is wonderful to have the team’s efforts applauded by winning not just one, but two, cutting-edge awards! The Maynard’s Marketing Department is no stranger to success, having also fended off international competition to win The Drum Network’s ‘Ad of the Week’ last year for the #MadeForGirls advertising campaign. In an unprecedented success for an independent school in Exeter, the 40-second film and corresponding print advertising campaign was voted ahead of global giants such as L’Oreal, McDonald’s, Samsung, Renault, Ambrosia and Cancer Research UK. “The Drum Network champions innovation and has a huge member network boasting up to 1.1 million visitors to its website each month,” said Joanna. “To have achieved more votes than these huge international brands – so much bigger than ourselves – was truly fantastic and made us very proud of our campaign.